We are a Mouse Mat. Hadar Ploughing through the Ice. 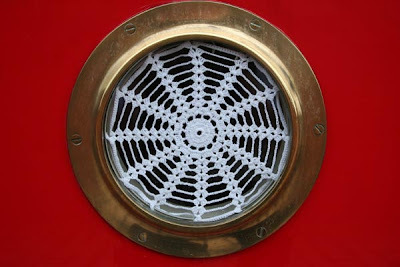 Yesterday we told you all that we went to the Crick Boat Show and that we bought some porthole lace. Well I thought you may like to see a photograph of the Spider Web lace in place. We are chuffed with our purchases. 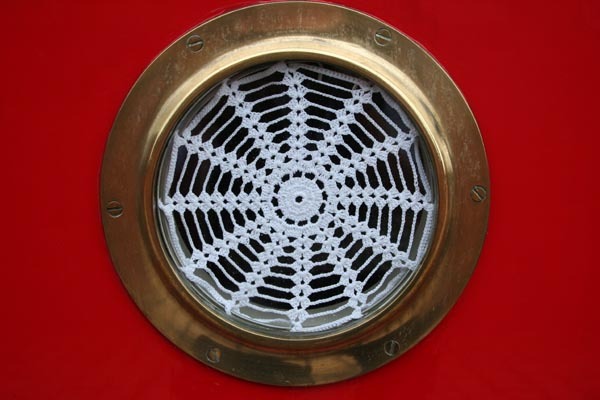 If you are looking for Porthole Lace give Sylvia Hankin a try at Artist of the Waterways. Today (Sunday) we got to go out with friends Viv and David on NB First Fruits. 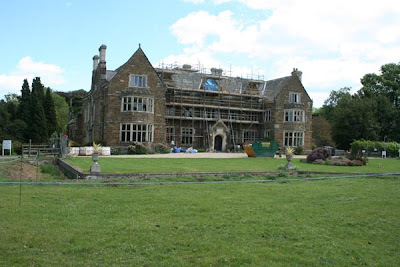 It was Viv's birthday and so we went to Launde Abbey. In the photograph below you need to look past the scaffolding to see the real beauty of the place. It is in a stunning location in the heart of the East Midlands. Thankfully the weather was much improved from yesterday. Today we had sunshine and a gusty wind. We spent time wandering around the gardens and the chapel, which is really stunning. 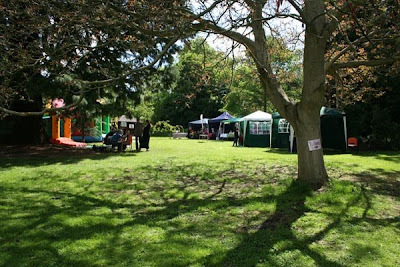 All the local churches supplied flower displays and in the grounds stalls were set up selling crafty things, plants etc. 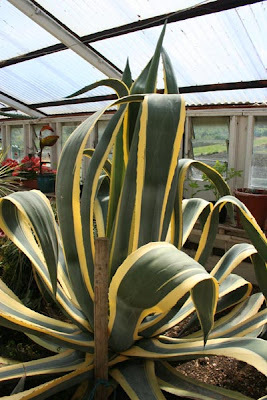 The Abbey has an amazing walled garden and in the walled garden they have a couple of green houses. One of then has cacti in them and it was a bit like the day of the triffids. The cacti were enormous. Having enjoyed an excellent morning strolling around the Abbey and gardens, we settled down under a gazebo to enjoy a buffet lunch, before heading back the scenic way to the basin and a cuppa onboard on NB First Fruits. We really did have a fantastic day with Viv and David, so a special thank you to them both for taking us out. 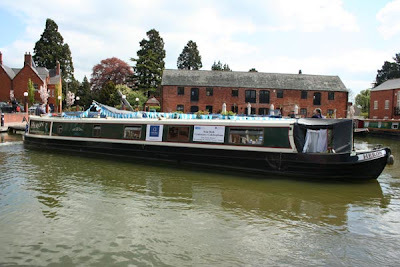 We have just got back from visiting the Crick Boat Show. We were offered a lift there, which we gladly accepted. It was a little damp, but we enjoyed it as we got to meet lots of our friends and had some good old chinwags with them all. Jo managed to pick up some porthole laces, some proper spider webs ones, which look really nice. She has been looking out for some for a few years now. I spotted a windy Klaxon, but it wasn't really what I was looking for at the price he was asking. It was nice to see the historic boats allowed back into the marina. We did notice though that the number of stalls is definitely done, as was the number of sales boats in the marina, I think this may be why they allowed the historic boats in to fill up some of the empty spaces! For those who were fortunate enough to be watching the BBC's "The One Show" tonight you will have been pleasantly surprised to have seen the above photo being shown. They had requested people to send in photos of people with their trophies, so Jo sent our photo taken of us last year at the Little Venice Canal Cavalcade after we had won the Vic Trott Trophy for best dressed boat people, with us in our costumes standing on the stern of Hadar moored up in the pool. We were amazed to see them show it. What was truly amazing was that their guest was Hayley Mills who was Keith's childhood sweetheart. Finally we have been able to post this video of Hadar, ploughing through two inches of ice during the winter of 2009/10 from Foxton to Market Harborough. On a normal day the journey time would be 1 hour and 50 minutes, but on this day it took us 6 hours and 40 minutes, arriving in Market Harborough in the dark. It has been a fantastic morning weatherwise, so this was our chance to catch up with some paintwork. It finally looks like the weather is warming up. 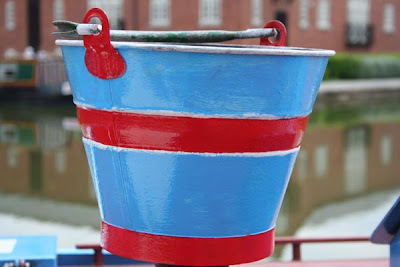 Keith turned his attention to the galvanised bucket. He has had this bucket for many years. 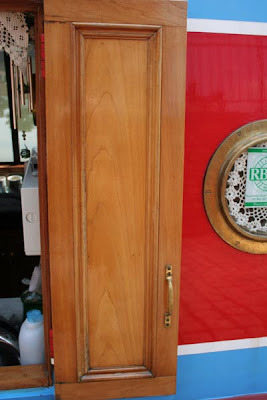 it used to be green with roses and Pisces signwritten on it, but the years have taken their toll on the paintwork and it was in need of some TLC. Keith is now painting it in the red, white and blue of the boat and will then signwrite Hadar on it. I turned my attention to our Ash Carrier which was a present from Mo and Nessa on NB Balmaha. 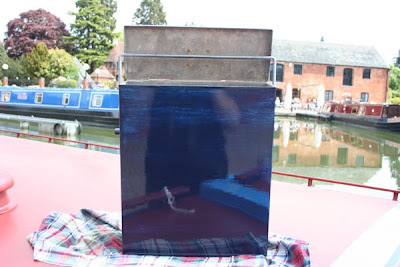 It is made of galvanised steel and so could probably cope perfectly well without being painted for a while, but I thought it would be nice to give it some added protection. Not only that Keith can then put the boats name on it, so it is personalized to us. Our Galley doors also got my attention today. I like to varnish them at least once a year, twice if the weather allows. It helps to protect the woodwork, as we like to have them open in all weather. With the morning jobs done, we are taking life easy in the afternoon, as neither of us wants to overdo things. Keith is now coming down off of his pain killers. This will take a few days and then we will know if he is really pain free. I am not pushing my shoulder to hard, as it gets very annoyed if I overdo things. I am hoping my Physio appointment comes through soon. Keith has completed his latest Rag-Rug. An experiment of phsycodelic circles. Someone somewhere might like it! To date everything seems to be going really well in my recovery, still no pain. Whatever they did seems to have done the trick. Hopefully Monday my GP will start to take me off the Dihydrocodeine, which has to be done slowly, at least then we could actually get moving, even if we have to return to Harborough for my biopsy results, it would be just so nice to get moving. Mind you I still have to fix the engine before we can move. Hadar's skipper is back home and is at the moment pain free. Keith has to wait for biospy results, which should be ready in 2 weeks, having had another cystoscopy, so we will not be moving just yet. He also had another procedure done on his Prostate, and time will tell if it has worked. So glad to have him back onboard. Yesterday was a busy old day for us both. I was so grateful to our friend Tina for taking us to and from the hospital, also for her staying with me throughout the day, as I waited for the phone call from the hospital to say Keith could come home. Tina and I actually had a girlie afternoon, with lunch at the Waterfront and a stroll around the Market Harborough shops, which was very enjoyable. All this was happening whilst poor Keith was going through his ordeal, but at last we finally feel he maybe making some progress, after all these months. We are seeing the GP on Monday to find out what is in the letter the hospital has given us and, if he is still pain free, we need to start taking him slowly off of the pain killers, which will be fantastic. So keep watching this space for further updates. We are having a 3 week break from selling coal etc, because I have been told to rest my shoulder. I saw the GP this morning and have been told I have adhesive capsulitis or the beginnings of a frozen shoulder to you and me. I am now on Diclofenic anti-inflammatories to see if they will calm the pain down. So with Keith going into hospital on Thursday as well, we have decided to take the boards down for the time being. Between you and me Keith and I are falling apart ha ha ha. It must be something to do with getting older. Geesh I have only just turned 48 and feel 98 today. Still I will do as the GP says and hope that my shoulder will be back to normal again after the 3 weeks, otherwise it may mean a steriod injection Ouch. On Tuesday we were joined in the basin by NB Heron and NB Jupiter, who are attempting to re-enact the iconic “Cressy” cruise. 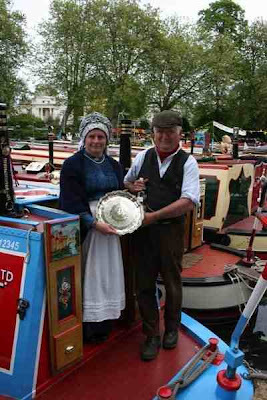 Ron & Mary Heritage from IWA Oxfordshire Branch left from Tooley’s Boatyard in Banbury at mid-day on 24 April 2010 in their narrowboat “Heron”. From Banbury, the cruise headed north towards Braunston. They then came on to the Leicester arm of the Grand Union Canal and descending through Foxton Locks to Market Harborough, site of IWA’s first National Rally in 1950. We have enjoyed some interesting chats with Ron. 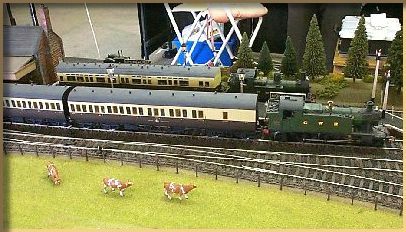 After they leave us they are heading north through Loughborough. You can see her other destinations on the IWA site. We wish them well with the rest of their journey, as they cruise the same route Tom and Angela Rolt on NB Cressy took all those years ago. Yesterday Keith and I travelled up to Kettering Treatment Centre, for Keith's pre-op assessment. Everything went well and he is booked in for next week, to have a couple of procedures done, with a hope to finding out the cause of his pain. By the time we got home we were both shattered, it felt like a long day, but infact we were home by 3pm. Later in the day we received a visit from Paul and Merleen, who used to have NB Lady Celine. Merleen very kindly bought me some beautiful Yellow Tulips, which are gracing our galley with their glorious colour. Thank you Merleen and Paul. It was wonderful to catch up with them, as they also have health issues at the moment. After a good old chin-wag, we wished them well, as they headed home. It was an exhausting day, but we are making progress at long last with Keith. Now we just have to keep our fingers crossed that, the hospital does not cancel next week. So please cross your fingers for Keith. Today we are taking things much easier. This morning Keith and I decided to walk down into the town for some exercise and to pick up some new paint brushes. Whilst down the town we noticed signs up for a Crafts and Arts Fair near Joules Eating House, so on the way back to the boat we wandered in to have a nose around and this was what we found on the Piggin Perfick Stall. Hadar is now being used as a Mouse Mat. 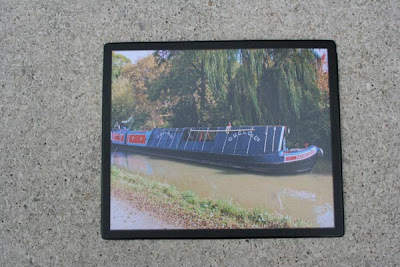 The photograph was taken on the 200th Anniversary Cruise from Foxton to Market Harborough in October 2009. If we had not gone in to the Fair we would never have seen it or bought it. £2.50 does not seem like a lot for a Mouse Mat, especially as it has Hadar on it. 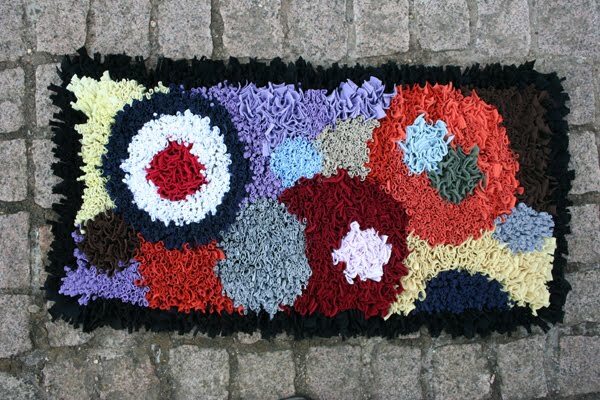 Piggin Perfick does limited edition products, Photographic and quilting, sadly they do not have a website. 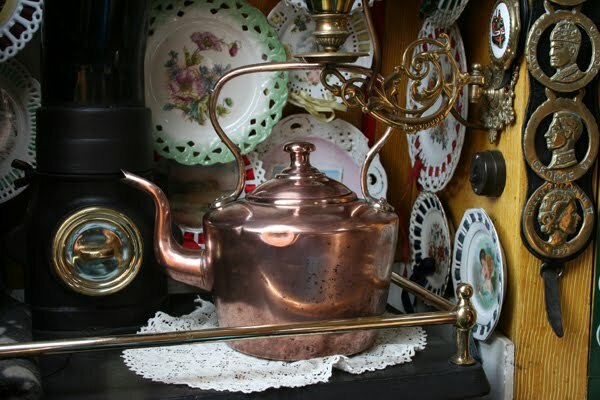 We also found this large copper kettle and just had to buy it, it was a bargain and a lot older than our existing one which we bought at the 2006 Crick Boat Show. Keith washed it and Jo polished it and very smart it looks too glistening and gleaming on our stove in the boatman's cabin.